Gilbert Magallon joined the Action News Team in November of 2017 as a multimedia journalist and general assignment reporter. He was born and raised in the Central Valley and is excited to be back and tell the stories of the people who live here. Gilbert has lived throughout the valley, including the communities of Dinuba, Hanford, and Fresno. 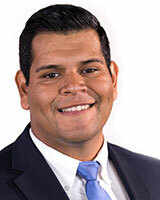 Previously Gilbert was a multimedia journalist at KNDO-TV and Telemundo in Yakima, WA. During his time in Yakima he covered everything from fires and floods to murders and immigration. Gilbert is a Bulldog, graduating from Fresno State with a B.A. in Broadcast Journalism. While in college, he interned at ABC30. It was through his internship that Gilbert fell in love with journalism. In his free time, he likes to travel, catch a good movie or spend time with friends and family. If you have story ideas for Gilbert, or if you want to know more about him, feel free to message him through email or social media.